Initially presented by the Kootz Gallery, Untitled remained in the collection of Judge and Mrs. Samuel I. Rosenman, the first White House Counsel (and the man who coined the term “New Deal”, among many other accomplishments! 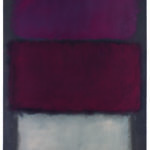 ), until 1964, when it was donated to the Guggenheim. In 1957, Zao embarked on a life-changing journey to the United States, where he began his collaboration with the Kootz Gallery. This won him enduring friendships with numerous American masters, such as Franz Kline, Philip Guston and Adolph Gottlieb, among others. Meanwhile, Zao’s revolutionary combination of the ancient oracle bone and modern painting style became instantly pursued by world-class museums, propelling the artist to becoming a leading Eastern figure in the golden age of abstract expressionism. The work will make its Sotheby’s debut in our New York galleries from February 5 – 10, alongside highlights from the upcoming London sales of Impressionist & Modern, Contemporary and Surrealist art. Highlights on view from the London sales will include the great Venice scene by Monet, the rare boat picture by Schiele, and more.